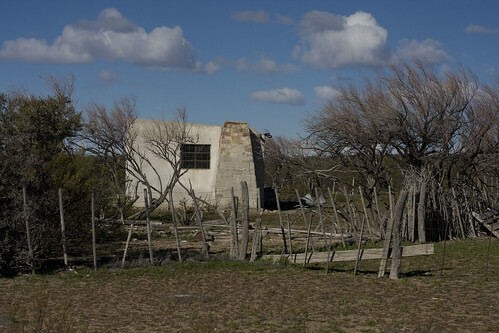 Patagonia is a land governed by the wind. Its windswept terrain seems desolate at first glance, but to the trained eye there are oases of life, and remnants of life that once was. 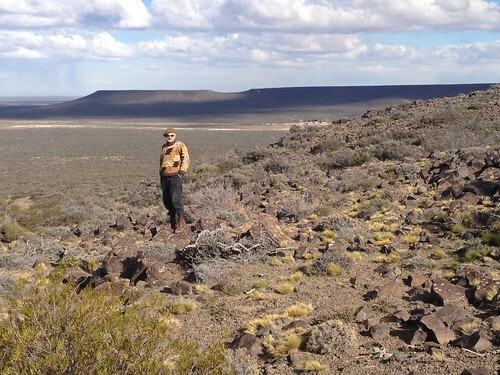 Telsen lies two hours by rock and gravel west of Puerto Madryn. 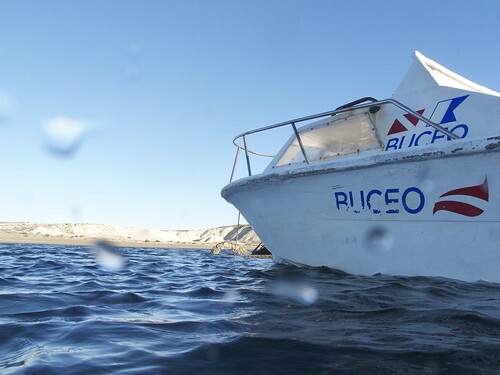 With the kilometer counter running, we had to follow a careful set of directions to learn where to turn to reach our destination – an Estancia of one of the family friends of the whale watching company I was working with. Compared to the rocky cliffs and flat grazing lands of Peninsula Valdes, the land here seemed to finally take form into plateaus and peaks. 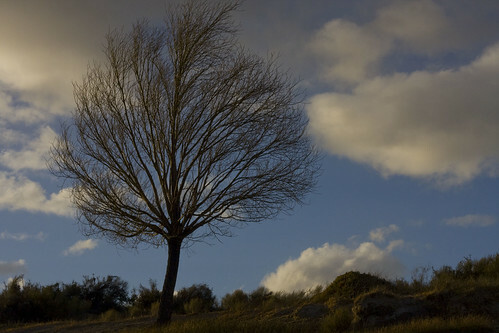 A few trees dotted the desolate landscape and shrubs and bushes abound. The few signs of human settlement were barbed wire fences delineating property and restraining sheep from wandering onto the roads – not that there were that many sheep to be concerned about. Whereas I had seen flocks of sheep littering the landscape of Peninsula Valdes, here only a few could be seen, and even fewer guanaco. I would soon find out why. Our hosts, dressed more traditionally than other Argentines I had met, greeted us in English and Spanish. They were eager to start our tour of their property, but only after sharing some mates and a quick snack. Their property expanded across the region, encompassing plateaus, small oases of naturally occurring water, and petrified forests. The area was ripe with fossils and antiquities. 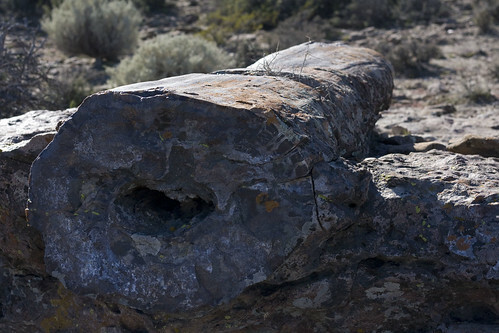 Once traversed by the natives (Tehuelche o Mapuche), their arrowheads and other tools formed from smoothed rocks and petrified wood littered the landscape. Each rock seemed a unique combination of hues, from translucent “Tiger’s eye” to vibrant reds and oranges. The petrified trees were even more impressive, and harkened to a time long before the passage of the natives. These timber giants were completely fossilized. The bases were nearly as tall as a short person (such as myself!). We could still count the rings and see the ridges, a testament to the living creatures they once were. Yet all of the wood and organic composition was now replaced with minerals, forever preserving its original form. Also littering the landscape were more recent signs of now deceased life. 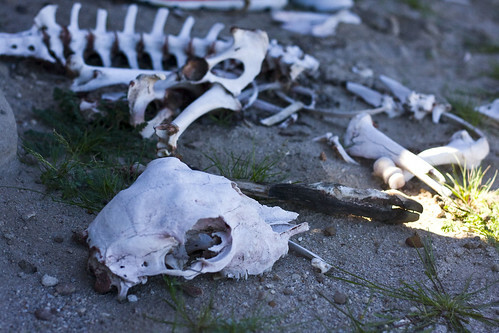 Elongated skulls of guanaco and shorter skulls of sheep could be found throughout our hike. Some of the guanaco had become entangled in the barbed wire fences, the result of misjudging the fence’s height and becoming ensnared in its lower wiring. The sheep had met an equally tragic fate. 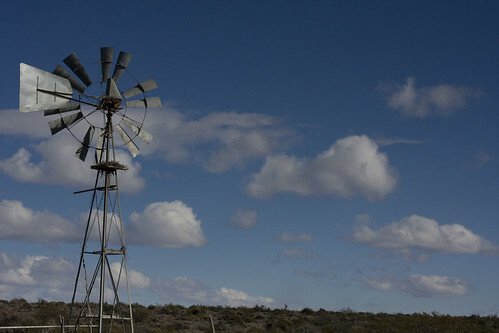 For six years, the land had been ruled by wind and drought. 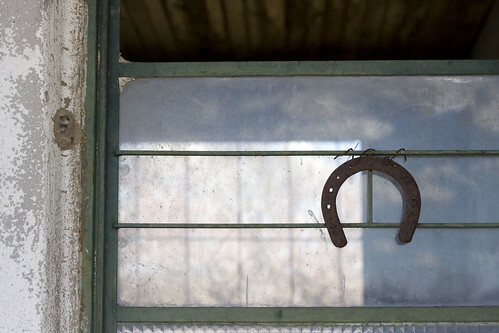 The family had lost nearly all of their sheep and the majority of their horses because of it. What was once their main livelihood had become unviable in a changing climate and rampant desertification. 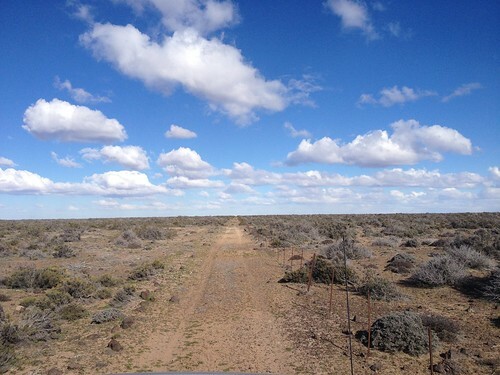 The desertification of Patagonia is one of the more well-documented environmental problems of the region. 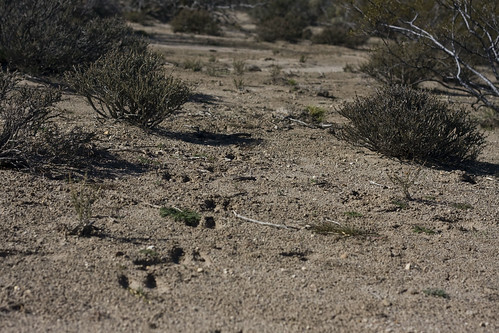 Overgrazing combined with an arid climate and water-starved soils lead to degraded vegetation and a desert-like landscape. When wool growers settled the region in the 19th century, they spurred this process through high numbers of grazing sheep, which reduced and degraded the region’s natural vegetation and foliage and depleted the little water that formed. As a result, sheep were in direct competition for scarce resources with natural wildlife, like the guanaco. They also became a prime target for predators like the puma. 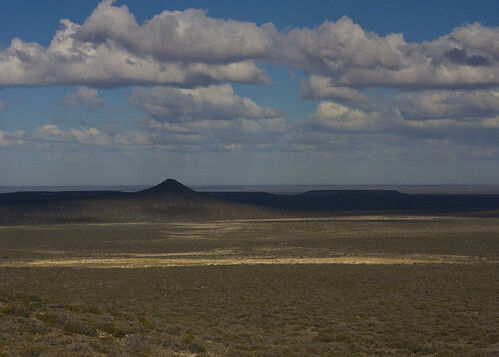 On Peninsula Valdes, an otherwise protected and preserved natural protected area, sheep grazing still dominates the land. Although hunting of guanaco is illegal, it still occurs due to lack of oversight and enforcement. Although the Peninsula was not as affected by the drought and desert conditions as Telsen, the numbers of sheep raised on the Peninsula have noticeably declined over the years (according to locals). In Telsen, a land far removed and remote from any civilization, the effects of the drought were more imminent and direct. Faced with the loss of a once reliable livelihood, this family is now searching for alternative forms of income. Why did they invite us to their land? To see if it would be viable as an adventure tourism destination. 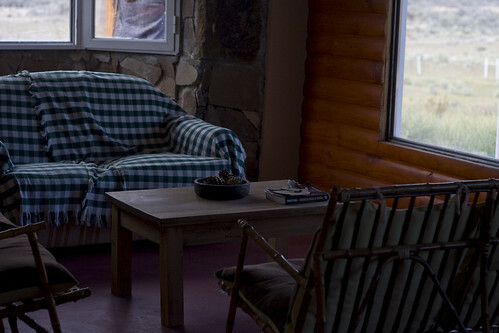 Here, the low-budget backpacker or middle-income adventurer could experience the true “solitario” lifestyle of the Argentine gauchos. 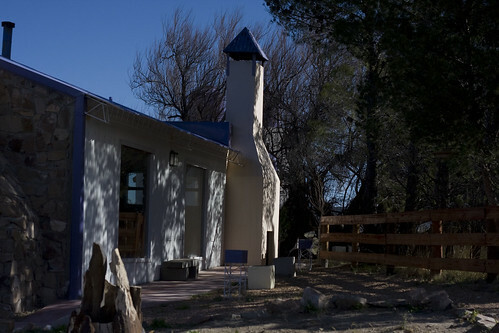 They had all the facilities in place – modest accommodations, grill spaces for asados, and an endless expanse of plateaus and petrified trees to hike and explore. 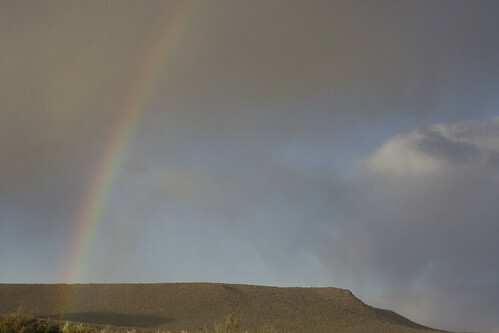 As if to signal the changing tide, and perhaps fortune, of the region – a light rain began to fall as we made it to the closest oasis to the estancia, with a single tree stretching upwards from the dry soil. When we returned to the main building, our hosts had prepared an amazing dinner – curried chicken – and dessert – homemade dulce de leche ice cream and Banana’s fosters. 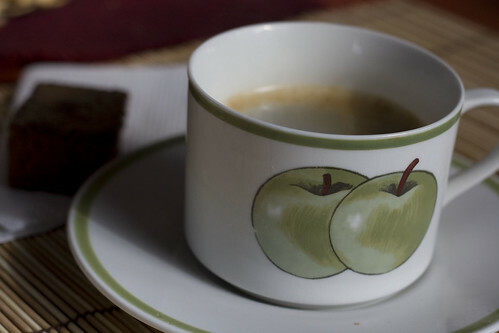 With a final cup of coffee, we began our long journey home. 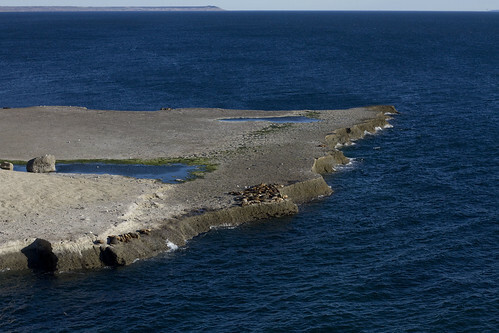 Punta Loma lies to the east of Puerto Madryn, beyond the Ecocentro and the beaches. Like El Doradillo, it is a popular destination for adventurous backpackers looking for a nearby bicycling or hitch hiking destination. 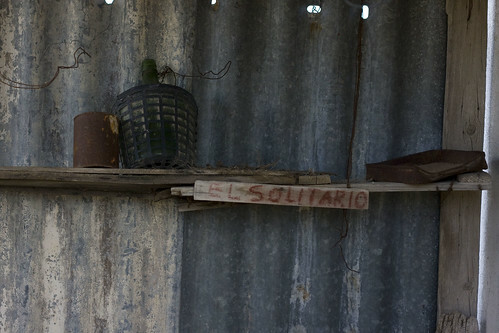 However, unlike my trip to El Doradillo, I arrived to Punta Loma by sea. 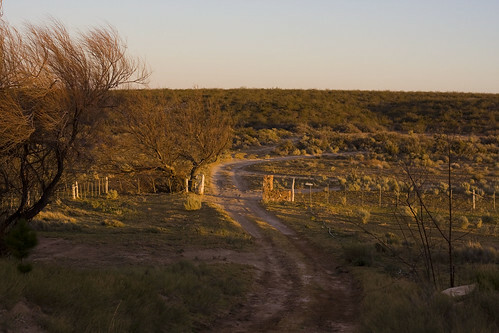 For land-goers, a dirt road leads to scenic overlook of the Gulf and one of the region’s growing South American sea lion rookeries. Since the 16th century, these gregarious marine mammals were hunted by European colonizers for their warm fur coats, meat, and oil. 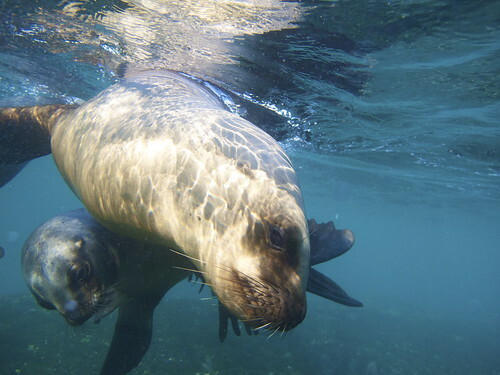 By the late 19th century, many sea lion rookeries had disappeared from the Patagonian coast. 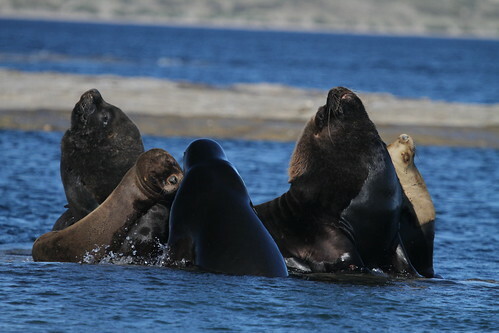 Sea lion hunting is no longer widely practiced in Patagonia, allowing these marine mammals to begin recovering. Rather than being targeted for their attributes, sea lions may be incidentally caught in fishing nets, or even shot by fishermen who view their growing abundance as a pest problem. As a result, populations in Uruguay and Chile continue to decline. Even though some hunting and incidental capture occurs on the Argentinian coast, its local population is actually growing as much as 5.7% annually. 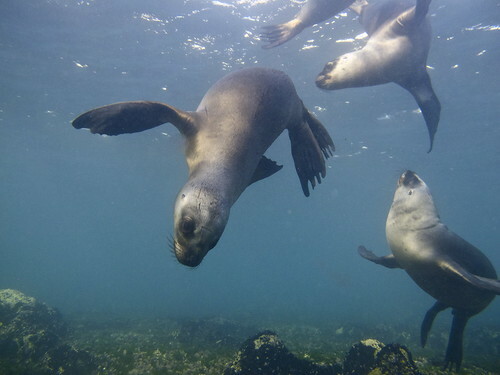 On their own, South American sea lions do not attract many tourists. From a distance, they are a clump of brown and black spots on the rocky outcroppings of Puerto Piramides or Punta Loma. During my surveys with visitors, respondents consistently listed sea lions as one of the last (or least favorite) animals to view in the region. Many tourists told me that they could see sea lions in their home cities of Mar del Plata or had seen them before in other parts of Patagonia. In fact, when I last visited Peninsula Valdes in 2010, I only recall briefly seeing sea lions in Puerto Madryn or Playa Union. They were hardly advertised or even featured as an element of the region. Yet, some enterprising entrepreneurs found a way to even make a buck out of the overlooked local sea lion population. 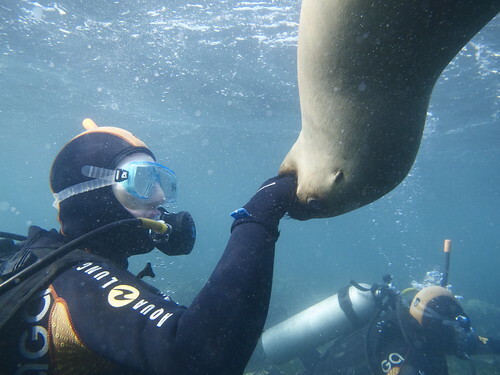 When I arrived to Puerto Madryn in June 2013, I could not escape the advertisements for SCUBA diving trips with sea lions. By far the most expensive diving trip offered (nearly twice the cost of a normal two-tank dive! 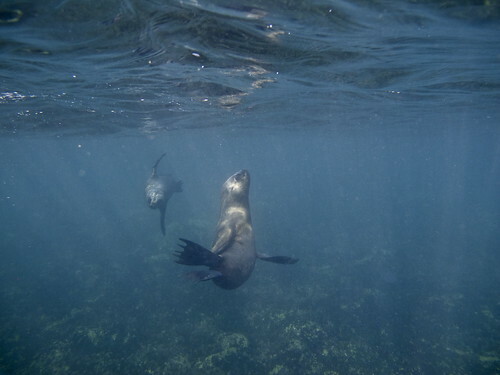 ), dive shops gloated of a unique interaction surpassing even the best experiences with sea lions in the Galapagos. 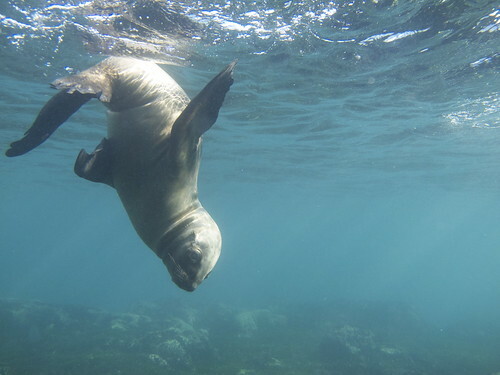 I couldn’t imagine how diving with sea lions could possibly be more fun, or interactive, than my experience in the Galapagos. One cold morning, I decided to sign up and give it a try. Even the mate and 7 mm suits couldn’t keep us warm that morning. At 7am, it was raining, and the lack of sunlight and slight ocean breeze sank deep beneath the neoprene into our bones. A few whales, unperturbed by the weather, passed by as we took a small boat to the dive sites. On the horizon, we could see a mast jutting through the surface of the slightly rolling water. 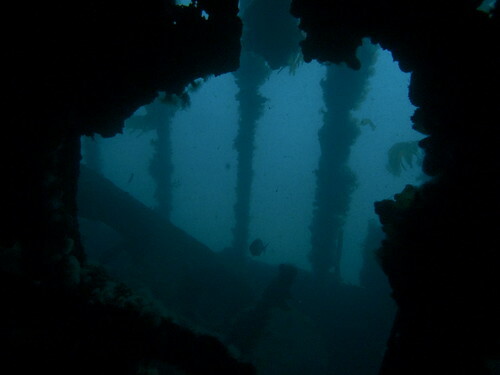 This abandoned ship would be our first dive. Somehow, even the water felt warm compared to the wintry surface conditions. We navigated a quick, 20 minute dive through the ship’s interior, exploring the most closed and overhead environment I had ever been in. Our fins easily kicked up the silty bottom, but, otherwise, the visibility was clear. 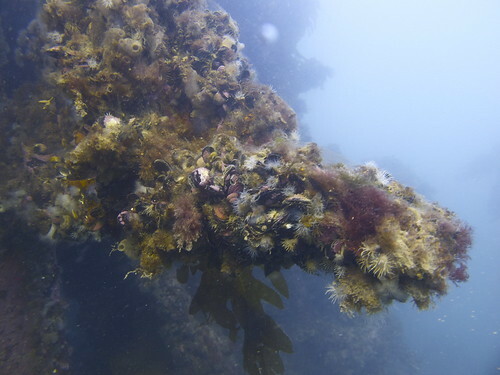 A plethora of microorganisms, starfish, anemone, and kelp flourished on the wreck’s dying body. A few fish lurked in the shadows, none venturing close enough to identify. After our brief shipwreck adventure, we took to shallower waters in search of the sea lions. Although only 6 – 12 ft (2 – 4 m) deep, the diving gear helped us stay just below the surface and keep our eyes open for curious pinnipeds. The turquoise blue waters were crystal clear here, making it easy to see the fast moving forms get closer and closer. Within minutes of entering the water we were surrounded. 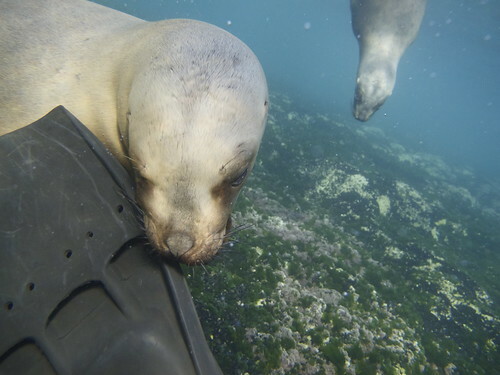 I felt a tugging at my fin – a young sea lion was biting at it! 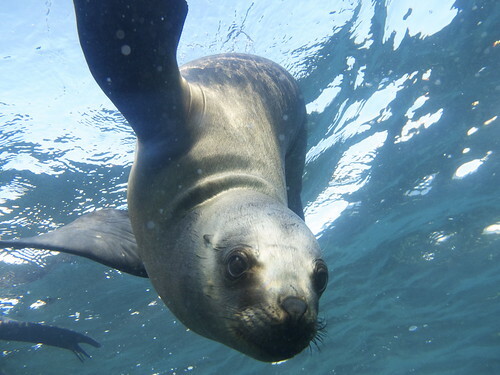 Cautious and inquisitive, the young sea lions dashed and twirled around our clunky, scuba-laden bodies. The matriarch of the litter was by far more bold and brazen. Like a labrador retriever, she would playfully bite our hands and snorkels, let her belly be rubbed, and swirl around us. It was exactly like playing with a litter of puppies – underwater. They seemed to enjoy the interaction as much as we did, but I had to wonder if this was adversely impacting the sea lions in any way. The activity was relatively new and minimally regulated. 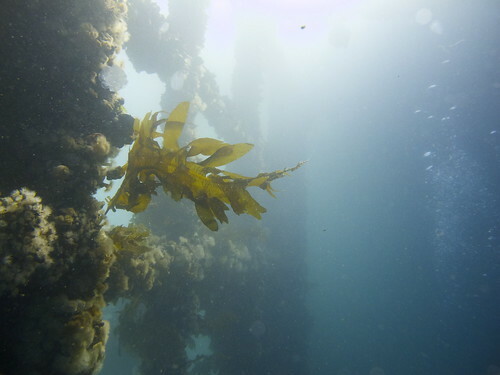 There were strict time limits on dive time in the protected area, and supposedly a vigilant guard armed with binoculars and a timer, but otherwise little oversight or regulation. 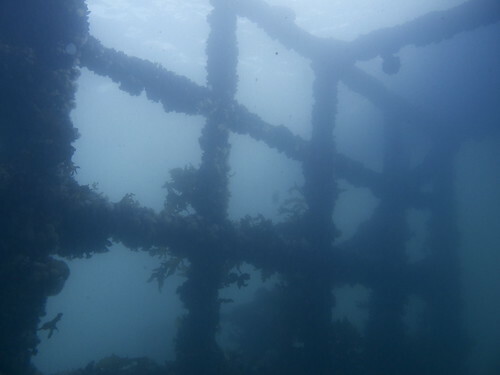 When I later spoke with marine biologists at CENPAT, I discovered that my concerns were not unfounded. 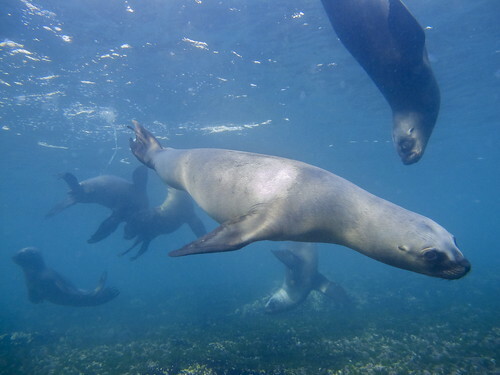 They too are beginning to investigate the human-sea lion interactions and find ways forward to support the conservation of this recovering population and the local livelihoods dependent on this new, and lucrative, tourism activity. The day, like many days in Patagonia, ended under a full sun and blue skies. Onshore, my newest travel companion, a street dog I would later adopt, was waiting for me. I enthusiastically stripped off the layers of neoprene insulation and returned to the daily routine of research. There were few tourists around, and I made sure to take advantage of the situation and survey the two other divers in my group. 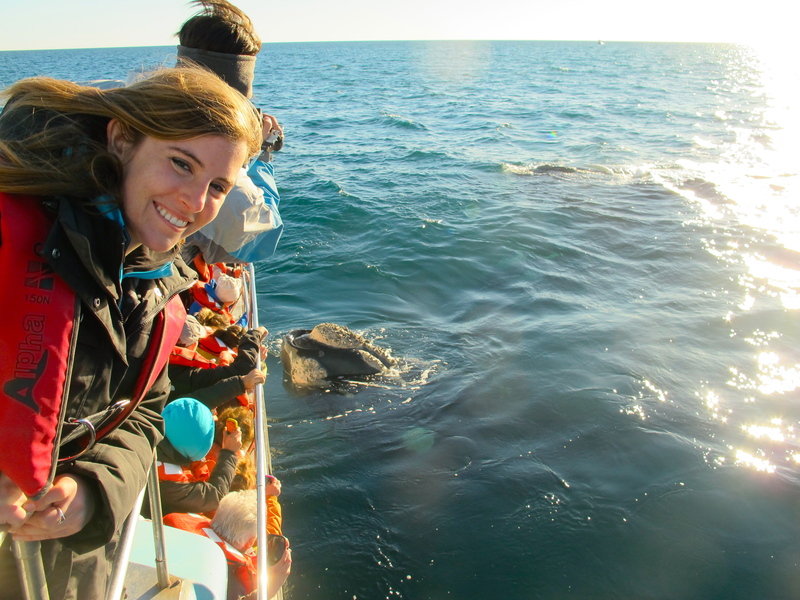 I was still a few weeks away from the Argentine winter vacations – two weeks in July when whales and tourists abound the coasts of Puerto Madryn and Peninsula Valdes. For now, I would continue to explore the town and the development of tourism in the region.